Whenever I’m in a store, I’m always keeping an eye out for existing items that can be stylishly geeked up. 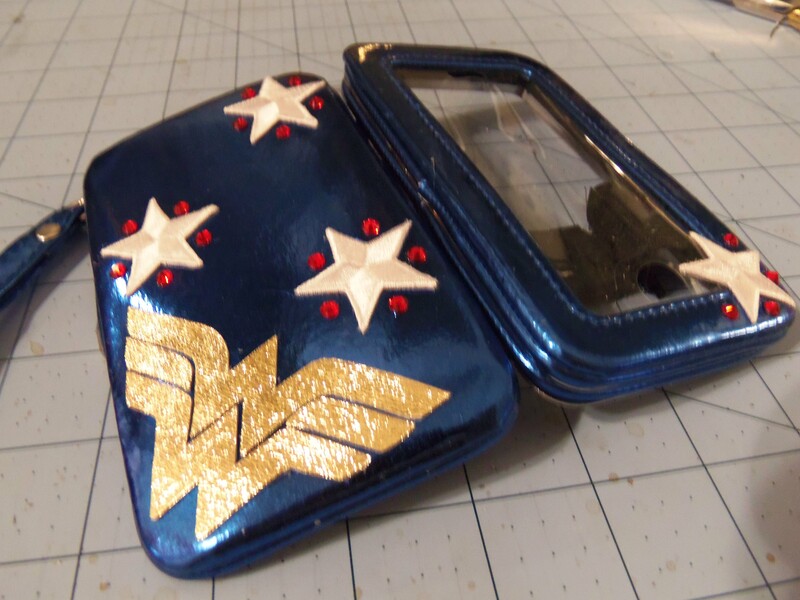 Target is currently stocking these wonderfully colorful metallic PVC purses, bags and iPhone wristlet cases by Xhilaration. 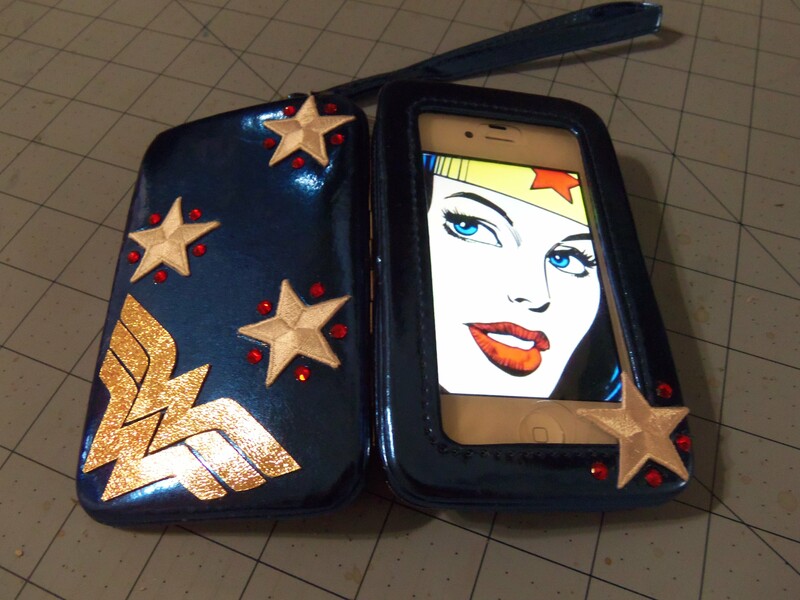 I was immediately drawn to these, especially the iPhone cases, and could see an abundant amount of DIY possibilities with them. My local Target only had the blue iPhone case in stock, which wasn’t a problem for me, as I knew something fun and simple I could do to geek it up! There’s a lot of different ways you can decorate a metallic blue surface like this. 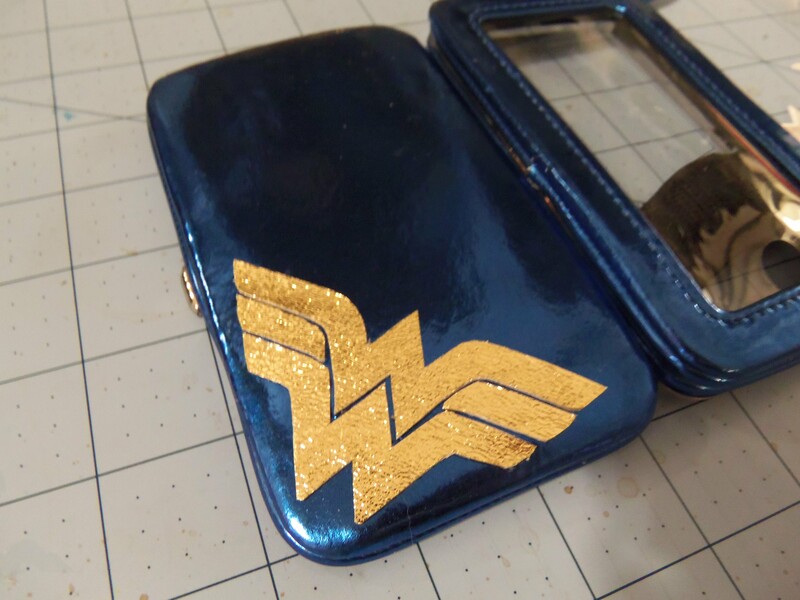 Since I already had some gold metallic leather on hand, making a Wonder Woman-themed iPhone wristlet seemed a pretty good way to go (Jean Grey or Superman would be too!). I already had red Swarovski crystals on hand as well, so I only had to pick up some small white embroidered star appliques from my local JoAnns and I was ready to go. There are very few steps to this DIY, all of which are simple. 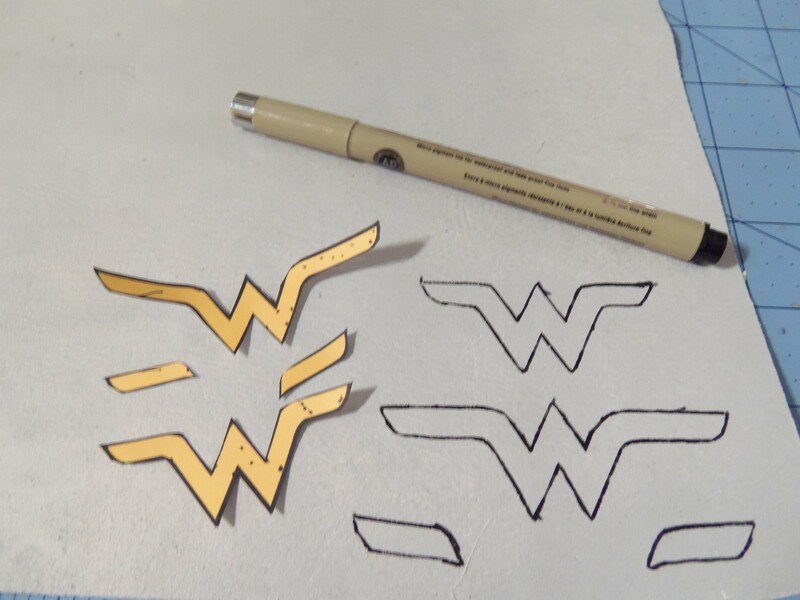 The only mildly time-consuming step was deciding what size Wonder Woman logo I wanted to go with, then cutting it, tracing it onto the back of my leather piece and cutting those pieces out. 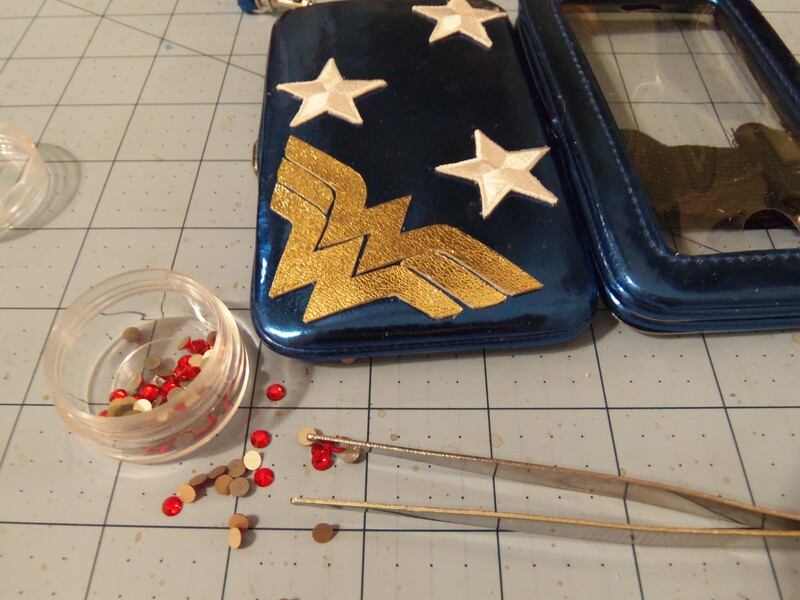 Actually I lied, there was one very time-consuming part of this DIY, and that was deciding where to place my Wonder Woman logo! Once you’ve decided where to place your logo, glue it down with E-6000, or whatever your preferred adhesive is. 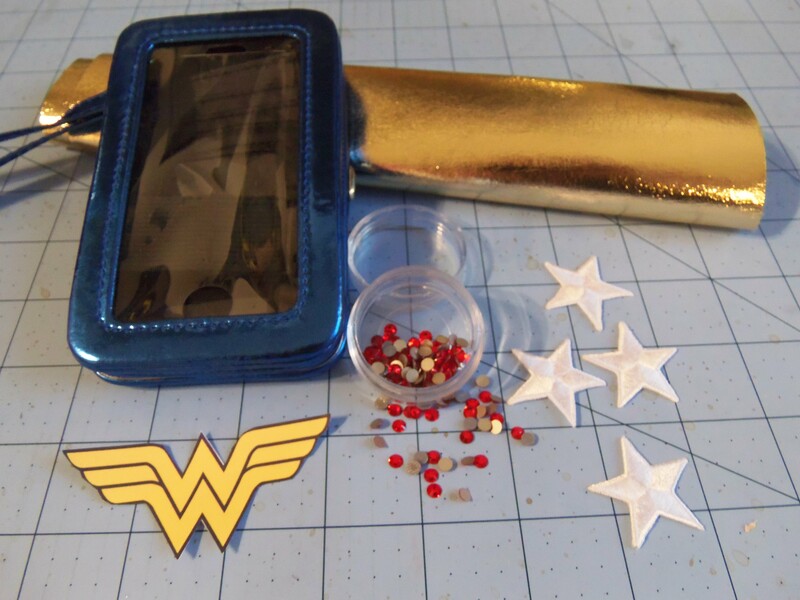 Then it’s time to glue down your stars and your crystals. Did I mention how quick and simple this project is?! 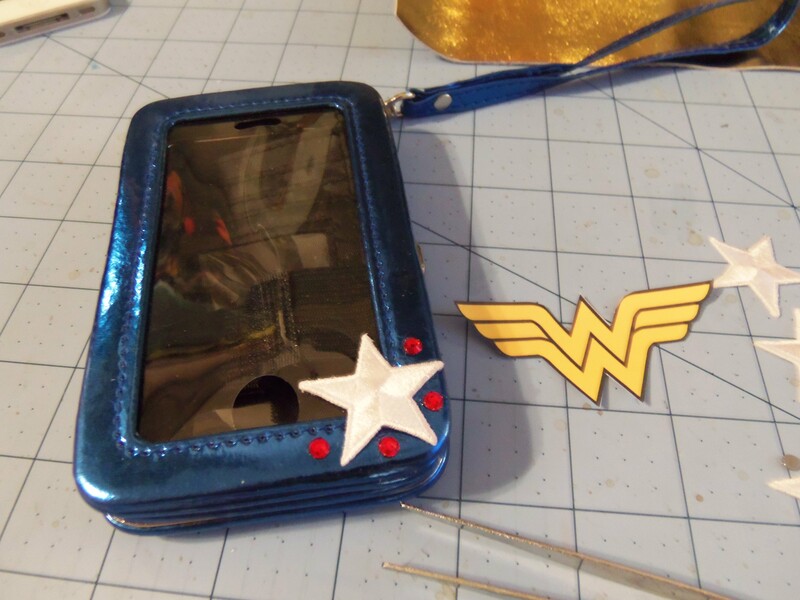 Originally I was just going to decorate the back of the case, but in the end decided to save one of the white stars so I could add a touch of Wonder Woman to the front half of the case. It’s a cute detail that is small enough to not interfere with accessing my phone. And there you have it! 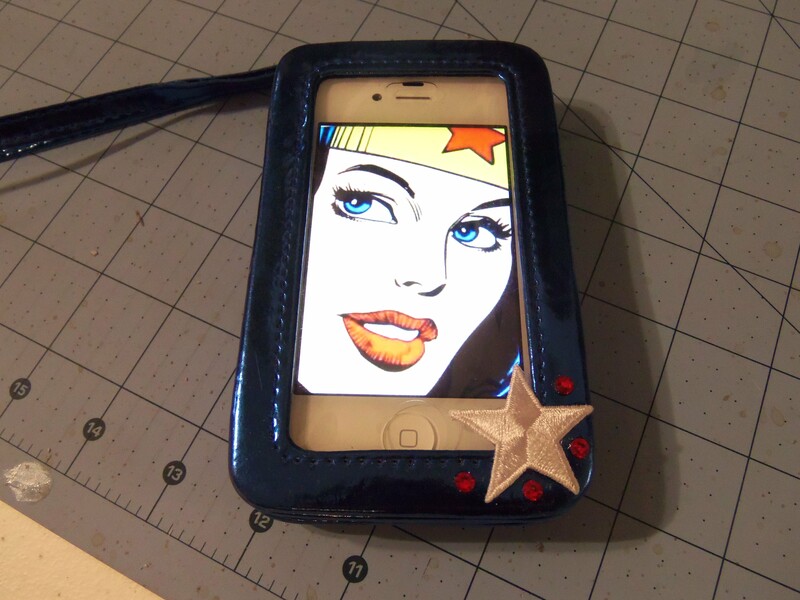 In a span of about 30-40 minutes, you can turn an iPhone wristlet (or any such thing) into a cute and stylish geeky accessory! 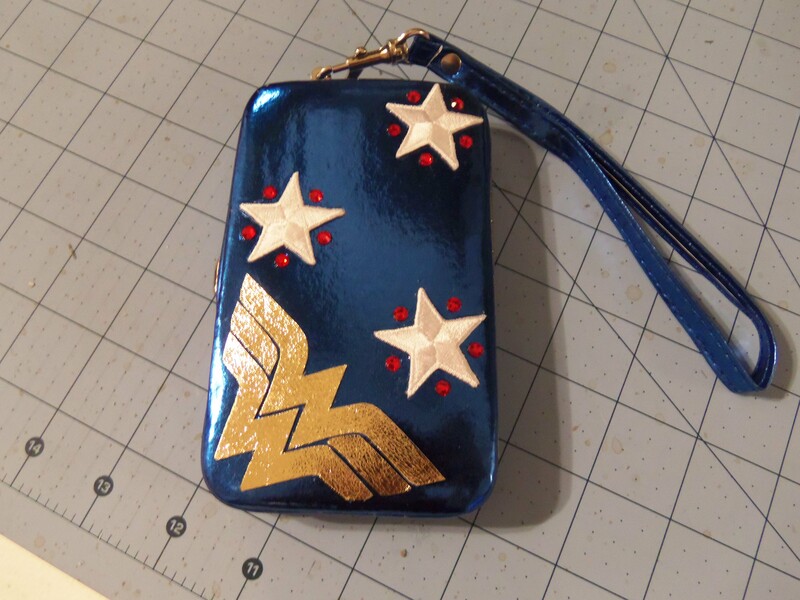 I can’t wait to carry my phone and money around in this newly DIY’ed case this weekend at Comikaze Expo! Hope to see some of you there, as we’ll be looking for stylishly dressed geeky ladies whose styles we can share on our blog. Hopefully you enjoyed this week’s quick and fun DIY. If you end up making something because of this DIY, or have already made something similar, we’d love to see it! Feel free to contact us through our blog, or via our Facebook Page. Where can I find the pic you have as wallpaper? Google! No, really. 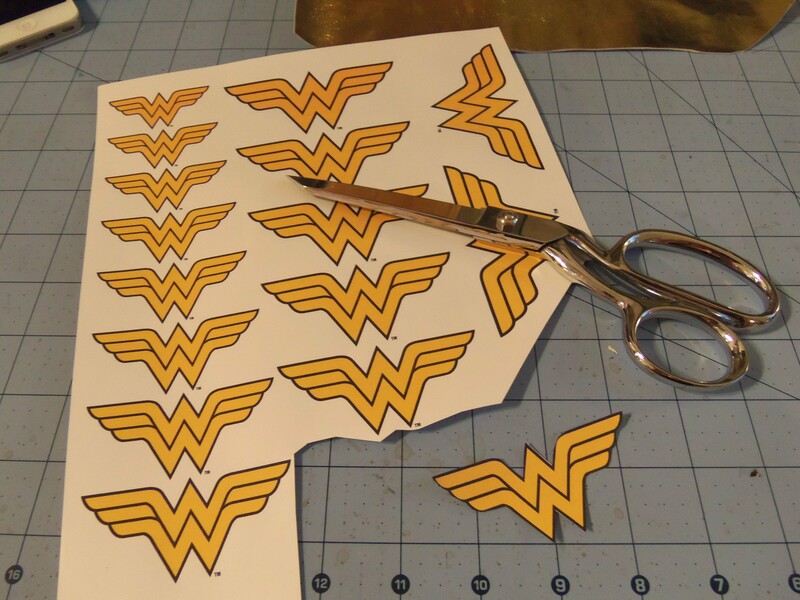 I just put “Wonder Woman” in Google and plowed through a lot of page in Images til I found what I wanted.